Searching for the existence of similar values between the excel worksheet columns manually is fine when we have few values in a column, but if you have thousands of values in a column which has to be compared with another column for identical values, it may take a decade to do so. Microsft's Excel is a powerful tool which can be used efficiently to do such a complex task in no time. For example, in the below image representation, In an Excel worksheet, we have values in two columns A and column C.
In order to identify and highlight the values of column A which are also available in column C, the Microsoft's Excel tool has several built-in functions and techniques to do so, whereas not every option is simple and efficient, so here we share one of the easiest ways among them. 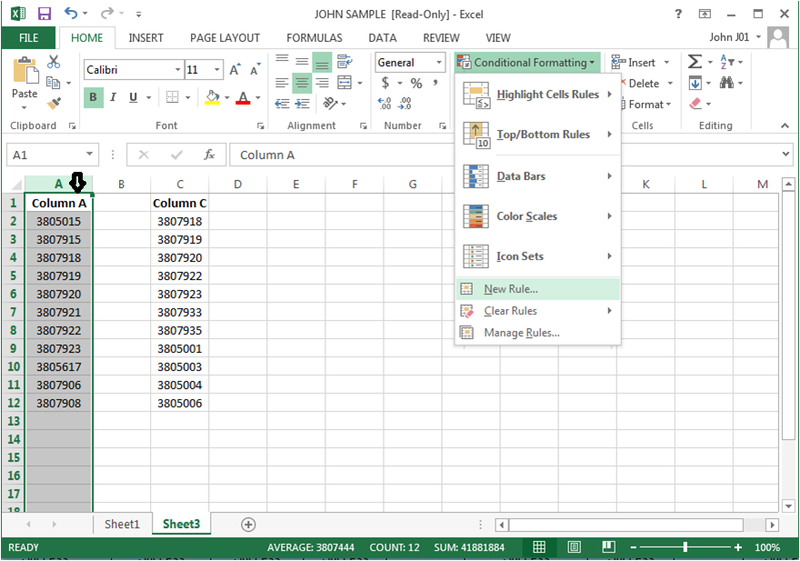 Step: Click on column header to select entire column values and Tap on "conditional formatting" on the menu bar and click on New rule option. 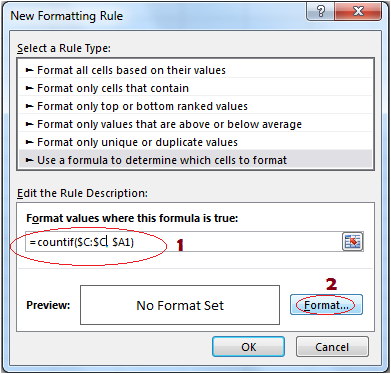 Now select rule type as "use a formula to determine which cells to format". And in "format values where this format is true field' enter the formula as =countif($C:$C, $A1). $C:$C = denotes the column to be compared. 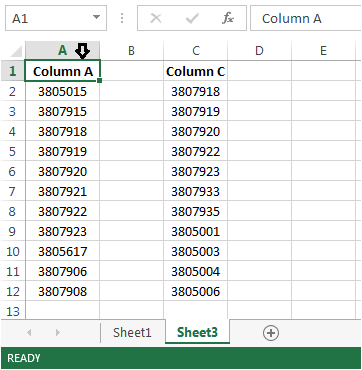 Note: change the alphabet in the above formula according to the column used in your excel sheet, here in this article, I have used column A and column C.
Then click on format on the same(New Formatting rule) window to open "format cells" window, here select any color of your choice to be highlighted when matching values found in the compared column. Now click on OK to confirm the chosen color. 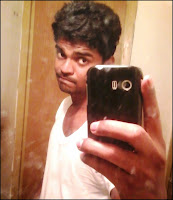 And the final result will look something like the below image representation. Also Read: How to customize Windows Sticky Notes fonts, color, text etc. 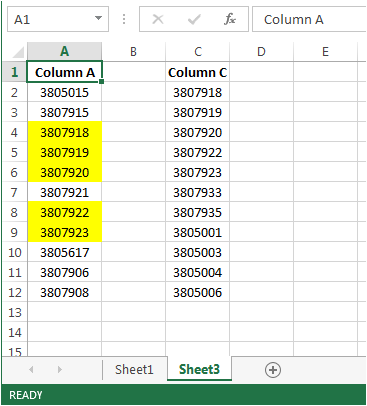 Additional Note: With the above steps we found the matching values by comparing a column with the other column and to segregate the highlighted and non highlighted values, use filter options in Excel itself to do so, follow the below steps. Select the column to be filter out. 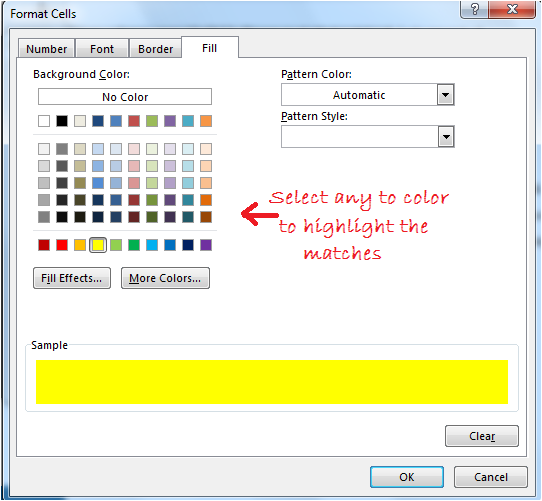 On the menu bar Tap on Data -> click Filter and a drop down arrow icon appears on the top of the selected column, click on it and select Sort by Color and select the color which is used to highlight the matching values.